ANS Classics Collection Updated for our 40th year! 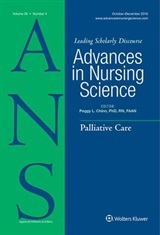 The coming year, 2017, marks the 40th anniversary year for Advances in Nursing Science! To celebrate, we will be updating he various Collections that are posted on the ANS website. The Collections are composed of notable articles published in the journal that have enduring significance for the discipline of nursing. The first Collection that we are featuring is titled “ANS Classics” – articles that are frequently cited and have provided a basis for a significant body of scholarly works that followed their publication. In recent years, there has been an emphasis on the most recent literature- an emphasis that has become stronger in the context of the very rapid growth of scientific and technological advances. But classic literature in any discipline provides the foundation from which the discipline develops, and much of what appears in the classic literature remains timely and current, retaining significance despite advances in the field. I invite you to browse the ANS Classics Collection! If you find that your favorite “classic” is missing from this collection, contact me! I welcome your suggestions! Congratulations on 40 years of excellence! In regards to the classics, which have many focused on ethics, I would suggest Randy Spreen Parker’s Nurses’ stories:The search for a relational ethics of care. This article depicted the reality of everyday ethics at the bedside and the power of narrative to transform care by acknowledging nurses’ voices-it also provided direction for my career and perhaps those of many others.